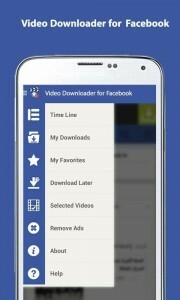 Download videos from Facebook is not yet offered by Official Facebook Team. But there are so many applications in playstore can do the download for you. All you have to do is, choose a best App for this download work. All Apps require your facebook login details. Keep in mind these Apps are not developed by Facebook. So providing Facebook login details may end up with risk. Just go to Play store from your android mobile phone. Put any one of the above titles in search box. After the installation, you need to give your Facebook login details to proceed further. Once you logged in, you may find the list of Videos from facebook. Just click on the video to download it in your Android mobile.